Newcomer Family Obituaries - Joanne Rose Kinney 1929 - 2019 - Newcomer Cremations, Funerals & Receptions. Joanne Rose Kinney, 90, of Denver, passed away January 31, 2019. Joanne was born January 2, 1929, to Franklin Alfred and Rose Helena (Johnson) Nugent in rural Madison, South Dakota. She graduated from the one-room Hart School, Orland High School and General Beadle State Teachers College all in or near Madison. Joanne taught in elementary schools at Brookings, South Dakota and Fairmont, Minnesota. She met Gordon Williams Kinney in Fairmont, and they were married October 4, 1953, at First United Methodist Church in Madison. After marrying Gordon, she moved to Colorado and raised two children. In addition to being a homemaker, Joanne also worked as the bookkeeper in her husband’s business and later began a successful career as a floral designer. Joanne had a lifelong love of teaching, and there was never anyone that was too young or too old to be her friend. She was an avid sports fan and enjoyed following and rooting for the Denver Broncos, Colorado Rockies and the Denver Nuggets as well as for the Chicago Cubs. Her greatest joy in life was being a grandmother, and she loved watching her granddaughter Laura swim and listen to her grandson Adam sing and perform in Community Theater. Joanne volunteered at Tollgate Elementary in Mrs. Herman’s first-grade class and for many years in Mrs. Katz's third-grade class. Everyone there knew her affectionately as Gramma Jo. Joanne was also the chair of the PTA Reflection program for many years at Tollgate Elementary. Joanne was very proud of the many lives she impacted as a teacher, a parent and as a Grandmother. She was most proud of the contribution she made to her grandchildren, as she was a constant source of love and support to them as young children and as adults. Joanne was an active member at Burns Methodist Church. She enjoyed singing in the choir and had a beautiful soprano voice. 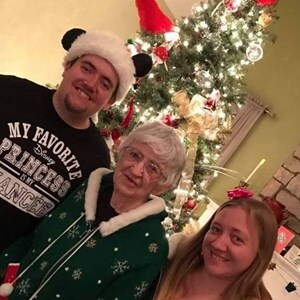 She shared a lifelong love of singing with her brother, and she passed on her love of singing to her grandson. Joanne is survived by her daughter, Jan Ellen Kinney; son, Ross (Susan) Kinney; two grandchildren, Laura (Chris) Albrecht and Adam (Lindsey) Kinney; sister June Otto, brother, Jim Nugent and many nieces and nephews. She is preceded in death by her parents, Franklin and Rose Nugent sister Joy Monahan Nugent and her husband, Gordon Williams Kinney. A Reception for all friends and family of Joanne will be held at Burns Methodist Church, 1095 Newark Street, Aurora, CO 80011 on Wednesday, March 20 at 3:00 pm. Private family services will take place at Ft. Logan National Cemetery. To share a memory of Joanne or leave a special condolence message for her family, please click the Share Memories button above. Add your memories to the guest book of Joanne Kinney. As most people will share, Jo had a profound impact on both my spiritual life but also my secular life. I will always feel her presence when I see a hawk on the wing, or stalking prey on the ground for that matter, a flower in bloom, children laughing, Pj Snangles, and wily coyote Jasper. She's one removed from this earth, but her love survives. May you Rest In Peace Aunt Jo. I’ll always remember you as so gentle and loving!!! My mothers little sister who she loved so much! I remember Aunt Joanne as a happy, joyful lady. She always remembered her nieces and nephews with birthday greetings and flowers for those special occasions. She was also an animal lover and as a veterinarian that has meant a lot to me. She was a wonderful mother, grandmother, wife, and aunt. I will miss her and be glad to have been touched by her love. Where do I begin to share my memories of Joanne. My first memories are of her working with my daughter and my son when she was the chair of Tollgate's Reflection Program. And I clearly remember her saying such kind and wonderful things to me about my son Colin at the Tollgate book fair when he was in 3rd or 4th grade. He and my daughter always spoke lovingly of Gramma Jo. I don't remember exactly when Joanne started coming to Burns and singing on the choir but there she was sitting next to me, and I do remember thinking how fun it was to have "Gramma Jo" on the choir. As time went on, I started to drive her to and from choir because she didn't like to drive in the dark. What wonderful conversations and discussions we had. We talked sports and about her love for her family, especially her grandchildren! Despite our age difference I considered her a true friend. She and Gordon sort of adopted my son Colin and always supported his baseball efforts both in high school and college. She also spoke often about Colin's singing both solos and on our choir. But even more she talked about how much she loved to hear Adam sing. Adam even sang on the choir with us for awhile when he was in middle school and it was always a very special day for Joanne when Adam came to sing a solo at Burns as an adult. Joanne was still riding with me to choir when her journey with cancer began. We were so sure that first lesion in her mouth was nothing but life had a different plan. She was so brave and handled her illness with such grace. I feel greatly blessed that I got to spend some time with her just a week before she went to heaven. Both Joanne and Gordon were special to me and my family. I am happy they can be together again, even though it was hard to say goodbye. It isn't the same sitting in the choir loft and NOT seeing Joanne out in the congregation. I know Joanne is singing with Jesus now-but she is sorely missed here on earth.